When you use propane to power your forklifts ,your employees can be more productive and your equipment will require less maintenance! Propane enables your workforce the ability to get more done on a daily basis, cutting down on refueling time and helping ensure your equipment stays in tip-top shape. According to a survey the Propane Education & Research Council conducted, safety was the most important factor when purchasing equipment for industrial applications. Because of the proven operating safety of propane powered forklifts, it’s not surprising that propane is the top fuel choice for forklifts. 1) Time: Refueling propane forklifts are minimal compared to electric and natural gas-powered forklifts. It takes 5 minutes to change a tank where it can take 8 hours to charge an electric powered forklift. 2) Cost Effective: Using propane enables your forklift to run 100% power throughout the operation increasing your productivity. 3) Safety: All propane powered forklifts have an automatic shut off safety feature that stops the flow of fuel in the event of an accident. Plus, all propane tanks are required to meet strict national safety specifications. 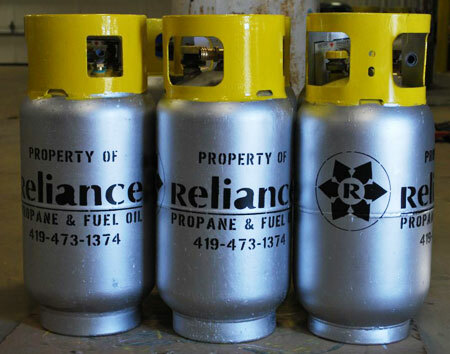 4) Green Fuel: Propane is a clean burning, non-toxic source of fuel. Forklift fuel has the lowest emission impact on the environment and the highest energy efficiency. With that said, you will do less maintenance on your forklift. 5) U.S.A.: Propane is an American Made Fuel. Enough said! 6) Portability: Propane is the most portable forklift fuel option; the propane cylinders can be stored nearly anywhere at your place of business. The ability to lift heavier loads more than electric powered forklifts. The versatility of using your forklifts both inside and outside. Call us today at 419.473.1374 or 1.800.473.1375 and learn how converting your forklifts to propane can help your business only save money, but also improve productivity.